Belgrade Airport Nikola Tesla is small and still has the 80s look from the old glorious Yugoslavian times. If you land here, there aren‘t many Cafès or extraordinary gastronomy points you can discover. But there is something unusual for a small capital Airport - throughout the whole year you can enjoy organic ice cream served from an old fashioned white ice cream cart. 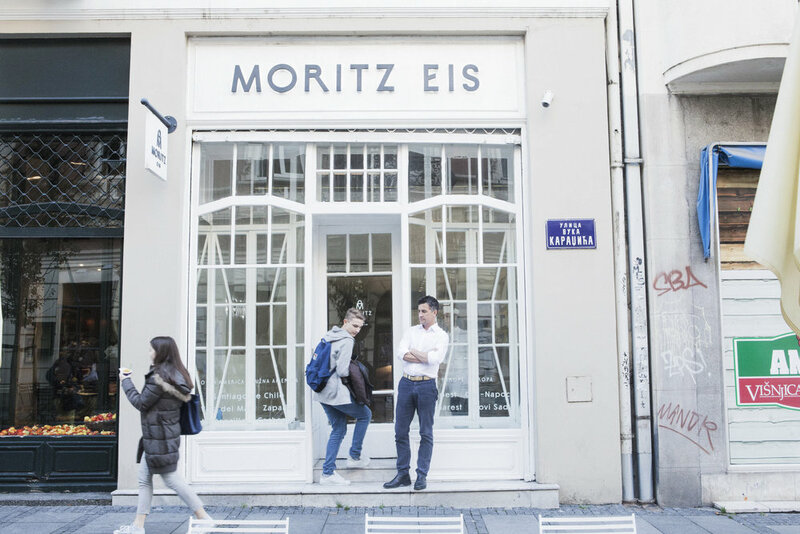 With a modern logo and an virtuous product, Moritz Eis shows the ability of the owner to adapt and orchestrate what is available and possible into something new for the area. Moritz Fried is an austrian banker who lived in France, Spain and Great Britain and comes to Southeast Europe to work for an investment fund. The elegant entrepreneur was not only fond of the rich raw natural resources but also by the unadulterated personal relations in the Region as well. The man who normally gets inspiration from classical music and nature, got the taste of the time. He founded the organic ice cream brand “Moritz Eis” in Belgrade in 2012, but very quickly expanded the business to Montenegro, Romania, Hungary and far away Chile. But what made an successful economist from Western Europe open an ice cream shop in a small country of Serbia? As an Investment banker in the region, he knew how to start up a business in Easter Europe, but also coming from Western Europe he saw space for improvement, especially in Serbia. WEAST: Mr. Fried why did you decide to stay in Serbia and make your own business? M.F: The reason I came to Serbia is because I left work in a bank in London for a friend who had an investment fond based in Rumania and Hungary and was going to open an office here. That is how I initially came to Serbia in 2008, 2009. Then three years down the line,thinking what to do in my life, I decided to embark in my own business. I wanted to stay here because I liked the city at the time. WEAST: You had a lot of international experience and enjoyed a lifestyle of a few European countries, what triggered you to particularly choose Belgrade? M.F: What I liked living in Balkans is that interpersonal relations are a bit stronger then they are in the west. Family and friendship ties seem to be old fashioned, stronger more in the old way, which I think it is the better way so I wanted to stay here. On the other hand, Serbia has a great resources in fruit and vegetables and has an enormous agricultural potential. And while here, I was missing a good ice cream in general here. So putting all this dots together, that is how it started. I have been quite fast in expending, in the second year we already opened a shop in Montenegro, in the third year we opened a shop in Chile, in the fourth year we opened a shop in Romania and also Hungary. WEAST: How did u come from Balkans to Chile? M.F:I have spent some time in Chile before, visiting my friend and a mentor living there. He was the founder of „The North Face“ and „Esprit“ but sadly he passed away last in December. I brought it to a conference in Prague. I traveled all the way to Prague by a train with boxes filled with ice cream and ice cubes that I constantly needed to replace to keep the ice cream from melting. It took me about 12 hours to get there. He tasted the ice cream and he said it was 5 stars, that I should bring it to Chile and that he will be mya partner, if I wanted. The idea was very tempting for me and Chile seemed like a good idea as the seasons are opposite to Europe - when the Ice Cream season in Belgrade ends, it begins in Chile. WEAST: How is the business in winter time here in Belgrade? M.F:The winter is tough. First of all it‘s in the mentality of the people here that they are a little bit superstitious. Many say: „You shouldn‘t eat ice cream in the winter time“. Of course, it‘s totally nonsense but this habit is changing very slow, maybe slower then I would like. But as normal as it is, a lot of people eat less ice cream in winter than in the summer. However we are still open during winter. We have a lounge where customers come, spent some time reading, or meet to have a coffee or a cake and it works. We also do concerts and a classic music matinee. We are trying to give more, to add something, not just sell ice cream. Indeed the jazz music playing in the lounge was turned down for the interview. Although the main color of the store is white, the first floor is a mix of vintage furniture, black and white framed pictures and a piano. Photography books are spread on the table. As soon as you walk in, it is clear that you don’t come here just for coffee and ice cream, but also to shut down the world outside and relax. The interior is an unobtrusive reduction but also a statement of simplicity. To understand its value it is important to put it in perspective with the environment - one of the first things that was renewed and reinvented after the crisis of the 90`s in Belgrade, was its gastronomy. It is an important and quitte vivid part of the culture to meet and drink outside. Therefore the cafès are constantly rivalling in all kinds of modern, relaxed, authentic or artistic design. Moritz Eis store competes in consequent silence, it is not allowed to smoke inside, which is still rare in the city. Mr. Fried ordered an espresso macchiato and water, but speaks quite slowly with an noticeable austrian accent. Although we both speak german, we chose to do the interview on english. WEAST: Did you had any cultural difficulties starting a business here? Was there something which you had to learn new? M.F: As I said the interpersonal relations are more important here than in the west. Decisions are made over meeting and drinking coffee with somebody. The typical everyday expression: „let‘s meet for coffee“, you don‘t hear that so often in Germany probably. In west Europe you just send an email, business is often done that way. But on the other hand, generally speaking, people are sloppier here. The sense of tidiness and accuracy is different here, but we have the same problem in Chile. It can be hard but also very rewarding, when you see all the nice comments in the guest book, and how the children are happy when they come into the store. It’s nice. WEAST: Do you think you influenced your environment in some way or another? M.F: For sure. We were the first on the market with creative organic ice cream and I‘m sure we changed the perception in one way or another. People never thought they would have a pumpkin ice cream, we have done over 160 tastes and different flavors. Our customer would come in and notice something new. And also a perception of an ice cream shop like this. It is a non the smoking place which is still rare in Belgrade. WEAST: Did the perception of Balkans change for you since the beginning? Do you sometimes think you would like to go back? M.F: I do not want to go back but my perception of Serbia has changed a bit. I was very enthusiastic when I came here but it is very sad that not much has changed since then. There is always an excuse not to get things done, most of the times because the things that happened in the past. It is because of Kosovo, Albania, Nato, Tito..lots of excuses not to do something and not to progress. And that is different in other countries, also in the East Europe. In Romania for example people actually get to act together and to clean the country. Unfortunately, the Serbian pride and identity are more restricted to waving flags at weddings and having trumpeters and talking about Kosovo. But I think there is much more potential than that, so unfortunately, a lot things seen and said every day are superficial. WEAST: Has the Montenegro the same nationalism and false pride problem? M.F: Montenegro is a totally different chapter. You could say they considered to be the brothers of the Serbs but their tribal structure is massive. It is that much stronger, that it will always rule above the law, so you will always lose if you are not from the tribe. Many business or political decisions are made because somebody is related to somebody, not because it is a good idea or somebody is competent. WEAST: Did this whole experience changed you somehow? M.F:Yes, it made me older (lough). In some sense, you have to be rougher here. In order to be taken seriously in place like Serbia, you need to be ta tough guy. WEAST: Success and business expansion give you right for creating an organic product in a package as an authentic brand . What inspired you and still keeps you inspired? After finishing the questions on english, Moritz Fred shares gladly even more details what can be improved in Belgrade in Serbia, on german. It seemed that there is a lot of improvement for the foreign entrepreneur. The waiter comes again and asks us for something more, Mr Fried discovers a small coffee stain on the table and asks the waiter kindly for more accurate sweeping. Interview is finally over and in the lounge is jazz music playing again.